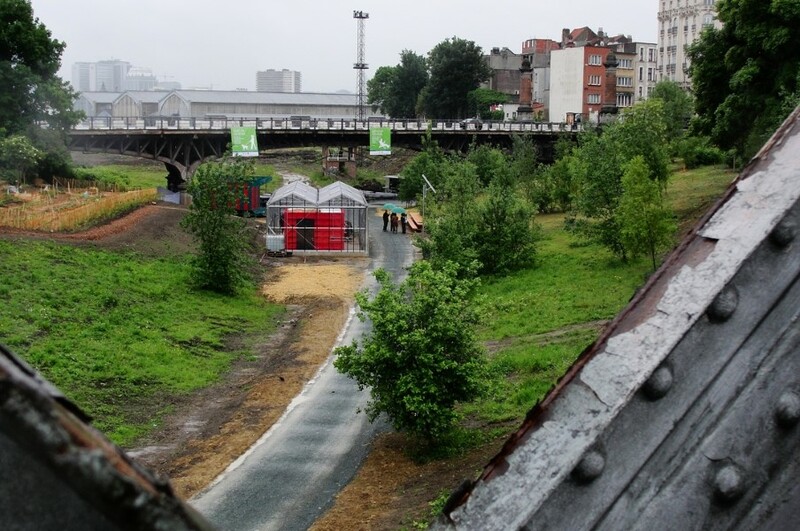 The 2014 edition of the Brussels “Parckdesign” festival – supported by Brussels Environment – comes to life in the new Tour & Taxis park from May to September 2014. Entitled PARCKFARM “From the landscape to the plate”, it invites visitors to discover a new park typology through art installations, agricultural performances and flavorful experiences. Take part in moments of exchange, practical and playful workshops (cookery sessions, gardening, mushroom harvest, composting…), debates, film projections, concerts… or simply enjoy a picnic hamper, a cup of coffee, tea or a glass of wine, in the FarmHouse. FARMHOUSE redesigned glasshouse is open to everyone and serves as a place to meet, cook, eat and have fun. FOODTRUCK is the mobile part of PARCKFARM, a van that turns into a kitchen, a workshop, a cinema, a stage and other things that will travel across the city. CUBIOUS In a strange two-metre wide cube, mushrooms, crickets and flowers are produced in close relationship to tickle and astonish your taste buds. KOTKOT is the project’s animal farm, a sustainable housing project for animals in towns, which relies on the neighbourhood’s participation. THE LANDSCAPE TABLE is a platform for cultivating, processing, cooking and sharing the food at the centre of the Parckdesign event. THE BLACK TREASRE FACTORY is a public waste processing installation based on the principle of compost toilet. BEE CAR is a beehive with five bee colonies in five huts. One of these huts is mobile and will move around the neighbourhood and the city by bike. ELECTRIC RAINBOW FARMFAIR is a very colourful luminous sculpture, composed of almost 1000 LED bulbs, drawing inspiration from the atmosphere typical of an agricultural fair and a country discotheque. The park can be reached from Pannenhuis metro station, and stretches between the Charles Demeer, Jean Dubrucq and Jubilé bridges this year. The FarmHouse welcomes you from Wednesday to Friday from 12 to 7 p.m. well as on Saturdays and Sundays from 10 a.m. to 7 p.m..